According to ‘Wikipedia’, Tempura Batter Recipes consist of Tempura and “is a light batter made of cold water (often sparkling mineral water is used to keep the batter light) and soft wheat flour (cake, pastry or all-purpose flour. Eggs, baking soda, starch, oil and or herbs and spices may also be added. One lady chef recommends that when you have put your Tempura Battered Food into the hot oil, keep shaking little bits of the batter onto the food cooking – just flick little bits on with chop sticks or similar. She added that it can get quite messy, but that’s the fun of it, and it will add to the crispiness. She grew up with a mother that did just that, and said it makes all the difference. What OIL to use when cooking the Tempura Foods? The purists use Peanut Oil – but it can affect the taste of delicate foods, so watch out. Apparently it is best to get the crispiest Tempura batter. But a lot of folk are allergic to Peanuts, so make sure that will not be a problem!! Olive Oil – a good oil but it may overheat and change the flavour. 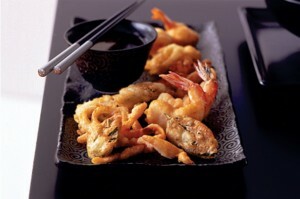 Grapeseed Oil – simple, can take the heat and will not taint the flavour of your delicate Tempura foods. Right, that’s the scientific bit out of the way. I have come to love Tempura Batter Food – it is light, crunchy, can consist of so many vegetables, fruit even (Try Elderberry Tempura), prawns, scallops, crab, most fish, and Jamie Oliver even cooks Lobster Tempura !!! ) You can even Tempura very thin strips of chicken. Just perfect, if like me, you occasionally fancy something light, healthy but absolutely full of flavour. If you have a ‘faddy’ grandchild, which I have had and do still have, try giving them Tempura Batter Courgette Strips, or thin Carrots, or Runner Beans, French Beans, Butternut Squash, Aubergine, Sweet Peppers, Broccoli, Asparagus, Fennel slices, Potato and Sweet Potato, Mushrooms and Bamboo Shoots. Mozzarella Cheese should be delicious, haven’t yet tried it. And even thin Apple or Banana Battered pieces. The dips and sauces can be anything you fancy, spicy, Sweet Chilli Dipping Sauce, healthy Greek Yoghurt with Garlic,Cucumber & Mint etc, or Yoghurt with Turmeric, or Lemon juice and zested or Saffron Mayonnaise (can be made with Low Fat Hellmans Mayo). For the Fruity ones, how’s about a simple Raspberry Sauce, sieved of seeds, or Coulis for you cheffy types! 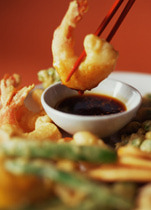 Another great point about Tempura Batter Recipes is that they are the ideal thing to share with family and friends. Get the extension lead out in summer, and use an electric frying pan or wok on the outdoor dining table. Just keep cooking the mix of food, whilst sipping a glass of wine or beer, and, watching your guests just drooling with happiness at the smell and taste of this brilliant healthy treat, just keep adding the pieces to the oil (keeping an eye on its heat). Go to the local Chinese supermarket and buy one of their wonderful wire strainers to get rid of any dark batter floating around in the oil. This basic recipe is taken from Taste AU, the Australian magazine. I'm just about to work out the UK measurements for Australian 'cups'. It is a good basic recipe, and you need to be quick and find a method of keeping the cooked Vegetables dry and warm whilst the rest are cooking. Probably dry well on kitchen paper, then put in dish on trivet warmed by a couple of night lights. Definitely don't want them soggy, heaven forbid! Place flours and baking powder into a large bowl. Add egg and mineral water. Stir (with chopsticks is recommended) until just combined (don't over-mi,,,,,, mixture does't have to be smooth). Pour into a large saucepan or wok until it one-third full. Heat over a medium-high heat until a small piece of bread sizzles when dropped into the oil. Use a thermometer if possible, to check the oil is around 170 - 180 C.
Dip vegetables, one piece at a time, into the Tempura Batter, allowing excess to drain. Gently lower into hot oil. Cook 3 - 4 at a time, for 2 - 3 minutes or until batter is crisp and light golden. Drain thoroughly on paper towels. Repeat until all vegetables are cooked. Serve immediately with with either Soy Sauce (salty) or choice of dip, mayonnaise or sauce. Freshly, finely sliced or grated, Ginger. My Choice! Put dash, mirin, soy sauce and sugar in a sauce pan and mix well. Bring to a boil on medium heat, then stop the eat and let it cool. Serve into individual small bowls. Add some grated daikon if you would like. Or Ginger!! Taken again from Taste.com AU. They know a great deal about Tempura! 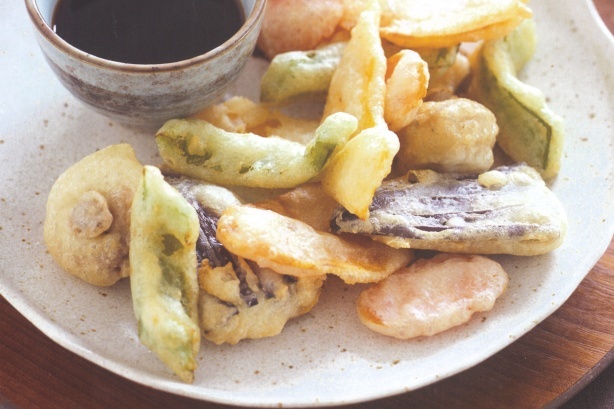 This recipe also suggests you sprinkle the finished Tempura (savoury) foods with some good salt just before serving. Sounds great. To make the Ginger sauce, heat the oil in a small saucepan over a medium-high heat. Add the ginger, garlic and chilli, and cook, stirring for 1 minute or until fragrant. Add the vinegar, soy sauce and water and bring to the boil. Reduce heat to medium and simmer, uncovered, for 3 minutes, or until reduced slightly. Remove from heat and set aside for 15 minutes to cool to room temperature. So that’s a bit about one of my favourite summer foods, when the vegetables are just waiting to be picked off the plants, or the prawns are calling out to be battered by Tempura. Love the lightness of the meal, and the fact that both herbs and spices will add such a lot of tastes without bad calories. One hell of a healthy summer coming our way in Hornsea. Looking forward to it. Kitchen Garden, Orchard, Recipes all coming soon. Recipes for My Mother’s Day Treat?